There is a very cinematic approach to this footage, and it certainly has the feel of an Alien property. This clip drives home the sense of loneliness, isolation, and fear that is so prevalent in the movies, especially the first film, and James Cameron’s 1986 sequel Aliens. Hallmarks of the franchise, these are all on full display here. Set in the interim between Alien and Aliens, Isolation places you in the point of view of Amanda Ripley, the daughter of Sigourney Weaver’s ultimate cinematic badass, Ellen Ripley. Amanda is first mentioned in the director’s cut of Cameron’s film. Set 15 years after her mother’s disappearance, Amanda now works for the ubiquitous Weyland-Yutani Corporation, and when they come across the flight recorder for the Nostromo, the ill-fated ship Ellen was on in the first movie, the quest to find her mother takes her to the planet Sevastopol. As you can imagine, she finds more than she bargained for in the form of armor-plated, acid-bleeding xenomorphs. That is enough to ruin anyone’s day, let alone the search for your mom. Available on all the usual gaming platforms, like PC, PlayStation 4, Xbox One, and Xbox 360, Alien: Isolation comes out later this year. 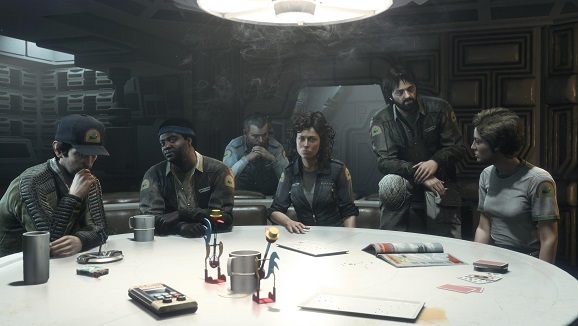 But if you preorder the game, you can get exclusive DLC missions that reunite the cast of the 1979 original, including Weaver’s Ripley, Lambert (Veronica Cartwright), Brett (Harry Dean Stanton), Dallas (Tom Skerrit), and Parker (Yaphet Kotto).